State or Province – Grecia is the capital city of the canton of Grecia in the province of Alajuela. During the September 2018 session of the Regional Committee of the Campaign for Latin American Cities and Towns for Fair Trade (CLAC, WFTO, SPP), the evaluation for the fulfilment of the campaign criteria was carried out by the Committee of Grecia, a city in northern Costa Rica, having promoted its star product – organic coffee, locally, regionally and nationally. Cooperative COOPEVICTORIA has been a very important actor in achieving this recognition, promoting the producers themselves nationally and internationally, advocating the principles of Fair Trade at the city level, and additionally involving many diverse organizations in advancing the campaign at the local community level. The mayor and local authority of Grecia through the municipal agreement N ° 14, totally supported the campaign and unanimously approved Fair Trade advocacy, adding this aspect as part of the public administration. 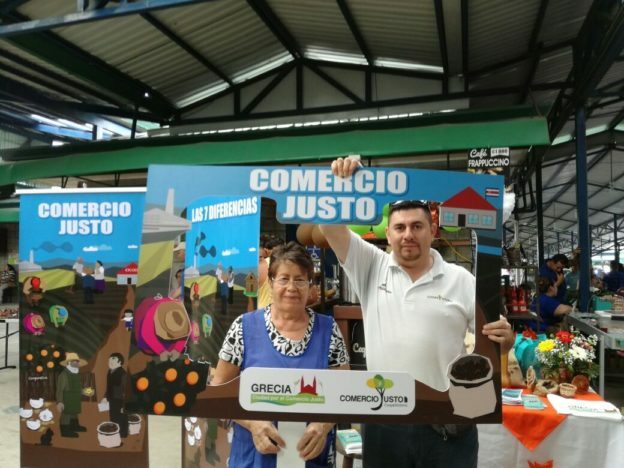 This was fundamental to Grecia becoming the second Fair Trade Town in Costa Rica. During the 12th International Conference of Fair Trade Cities in Madrid in 2018, Grecia participated with a delegation headed by the Mayor, Mainor Molina Murillo who was able to share the experience of the city with other delegations, learn more about the global movement of Fair Trade Cities, expressing its maximum support by proposing to announce Grecia’s Fair Trade City status on December 1, a date in which the city of Grecia logo will be launched with the assistance of national authorities. In addition, it should be noted that the committee has agreed to purchase Fair Trade products through a public procurement memorandum. develop an annual work plan of the local committee. Ongoing projects include the formation of organic gardens and recycling initiatives. The Committee has also developed strong links with educational institutions, in particular, the academic research carried out with the University of Costa Rica on the benefits of Fair Trade and its ripple effects. According to Edwin Vargas, representative of the Latin American Coordinator of Small Producers and Workers of Fair Trade (CLAC) , local actors from Greece were invited because the city “has the oldest cooperative of producers in the country ( CoopeVictoria ), in addition to having programs with a lot of social impact such as water protection, production of biofuels, and focused work on generational change and social and environmental sustainability “.